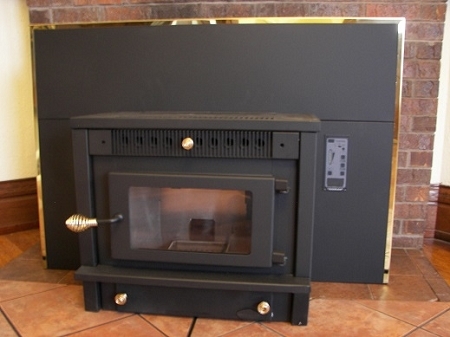 MATTE BLACK Unit Being Sold, 40,000 to 50,000 BTU/Hr., NOW IN STOCK! Introducing the HIGH TECHNOLOGY FIREPLACE INSERT with heat output 40,000 to 50,000 BTU/Hr for Wood Pellets and for Corn, and will heat 1500 to 2000 Sq Ft home. This auction is for a Matte BLACK, but a GOLD Door is available for $200 more (also in stock!) as an add-on option. Note that all Add-on Options will be paid in a separate Ebay buy-it-now transaction. This is an unusual opportunity to buy a Fireplace Insert that is IN STOCK and can be delivered to you immediately after payment. Some of its High Technology features are: Auto Ignition, Corn Multi-fuel Conversion Kit, Negative Pressure Burn, 10-Tube Stainless-Steel Heat Exchanger, Electronic Digital Push-button Controller, Thermostatic Control Options, Diagnostic Readoputs, Safety Shut-down Features, ASH Drop and Ash Tray, Clean Glass Air Wash System, UL and ULC Approved, EPA Exempt, Zero-clearance Capability. This unit is being sold at a DISCOUNT from the recommended Manufacturers Recommended Selling Price of $2,495. The Corn and Multi-fuel Conversion Kit that will enable it to burn Corn and other Multi-fuels. I has a large ASH TRAY drawer that reduces the cleaning frequency...most other fireplace inserts don't even have one! The Hopper Bin in 40 lbs and you can adjust the fuel feed from 1 to 4.5 lbs per hour. Manual draft DAMPER control allows easy adjustment for fuel and draft conditions. It has an adjustable fan speed control for room air. Negative pressure burn box prevents spillage of smoke and fumes into the house. Safety features include a top-load fuel system separating the burn pot and hopper bin thereby reducing the risk of burn-back (hopper fires!). Other Safety Features are automatic shut-off for out of fuel, shut-down due to malfunction. For power outages, we have a POWER OUTAGE Module available for you for $179. Digital Thermostat option avaialble for $72 and a Remote Control thermostat option is available for $245. There is a Diagnostic Readout for troubleshoooting. There is an effective air wash system that keeps the door glass CLEAN. Note: There is a PEDESTAL BASE-MOUNT STOVE also available for the same price. It is certified and approved for residential and mobile home installations in both the USA and CANADA. This Fireplace Insert is also certified for masonry fireplaces as well as Factory-built Zero-clearance Fireplaces. The manufacturer's recommended selling price or MRSP for this unit is $2,495 but we are selling it at a DISCOUNT. Supplies are limited as we are keeping the warehouse inventory low for this heating season. At a low particle emission of 1.829 grams/hr this unit meets or exceeds the EPA Certified Phase II Emissions Standards at 7.5 grams/hr for non-catalytic wood stoves and 4.1 grams/hr for catalytic wood stoves. It also meets or exceeds the strict CALIFORNIA Standards, COLORADO Phase III Approved, state of WASHINGTON Standards (less than 4.5 g/hr. ), and the strict OREGON Standards (less than 2.5 g/hr) for particle emissions. Note for another $1000 we have available to our customers the highest quality INSERT made (a different stove) which has the WORLDS LOWEST PARTICLE emissions rate at .60 g/hr.! All OPTIONS will be paid in a separate Ebay buy-it-now transaction. The OPTIONS AVAILABLE are: (1) CORN and MULTI-FUEL Conversion Kit add $200, (2) Surround or Flashing add $200 for Medium, $275 for large, (large shown in pic), (3) Gold Door add $200, (4) Chimney Flue Exhaust Kit add $665, (5) Direct Flue Exhaust Vent Outside and up 3 feet add $365, (6) Fresh Air Kit add $145, (7) Corn Screener/Cleaner $65, (8) Wall Thermostat: Digital add $72, Dial-indicator $35, (9) Remote Control Thermostat add $245, (10) Power Outage Module for $179, (11) Hot Ash Vac $249, (12) FANS Air Circulation Doorway Corner and Room-to-Room $40-$65, (13) Pedestal Base Mount is same price, (14) Low particle emissions of 0.60 grams/hr are available in a different HIGH QUALITY INSERT for another $1000. Note again to repeat: all Options will be paid in a separate Ebay buy-it-now transaction. A Power-Outage Module is available at $179 to supply 115 VAC to your crucial electrical devices ... a smart item to have as backup in power outages. Use this module for POWER OUTAGES and you can run it from any 12 VOLT BATTERY either a Car battery or a Deep Cycle Battery. It supplies 1000 WATTS (Model 1) of 115 VAC POWER with two outlets and battery cables are supplied. There are other models available: (2) 1550 WATTS $249, (3) 2550 WATTS $345, (4) SINE WAVE at 660 WATTS continuous hookup/recharge $349, (5) SINE WAVE at 1000 WATTS continuous hookup/recharge $495. Each one will will run a variety of devices such as a CORN STOVES, WOOD PELLET STOVES , furnaces, computers, appliances, lights, sump pumps. It even has a USB Type A outlet that allows charging of IPOD's, Blackberrys, and Cell Phones. SIZE: 10 inches Wide, 5 inches High, 15 inches Long, WEIGHT: 15 lbs. Below we are listing the fireplace insert dimensions for Front (in front of fireplace), Rear (sticks into fireplace hole, Hole Opening recommended, Space clearance recomended, Surround Dimensions. Note that the picture shows the Large Surround, but the smaller surround is also available. REAR (Sticks into fireplace hole): Width 21", Height 19-1/2", Depth 9". Note the rear only sticks into the fireplace opening 9 inches! You can have a taper back smaller than 21 inches because the rear extension stops at 9 inches. Another alternative available to you is to buy a Pedestal Base-Mount Free Standing Stove that is available to the same price. Option add-ons are the same ofcouse there is no surround. You can put the pedestal mount anywhere, even in front of the fireplace mantel. Another alternative available to you is to burn Corn using our Corn-Burning Mult-Fuel Conversion Kit. this will also enable you to burn multi-fuels. Components include a stir-rod mechanism that mixes the corn up and eliminates the formation of clinkers. Use of a sprinkling of Crushed Oyster Shell in the Hopper Bin will contribute to oxygen release and will facilitate a complete combustion and help eliminate clinkers. It is possible to either run this Fireplace Insert with either a Thermostat or without one. The switch at the top of the digital display has either AUTO Mode, HIGH/LOW Mode, or Manual Mode. In AUTO Mode, the thermostat will turn the insert(stove) on by electric igniter. In HIGH/LOW Mode, the thermostat will set from the factory low setting to your desired Heat Select setting. If you run in thermostatic mode, it is recommended you run in HIGH/LOW Mode. The thermostat hooks up to two terminals in the rear of the printed circut board. We sell either a Digital (Round or Square) or Dial-Indicator Thermostat. Note we even have a Remote Control Thermostat option. Suggestion: if you elect a thermostat option, we suggest running the stove without one for 1 to 4 weeks so you first become familiar with the operation of the stove on a stand-alone-basis. FIREPLACE INSERT: Fire Rite Technology w. Surround, 52,500 BTU/Hr., Mult-fuel Capability, 2500 Sq.Ft. FIREPLACE INSERT: 3-Bay Window, 50,000 BTU/Hr., Wood Pellets, 2000 Sq.Ft. FIREPLACE INSERT: Air Filter King w. Surround, 50,000 BTU/Hr., Mult-fuel Capability, 2500 Sq.Ft. FIREPLACE INSERT: Colonial Cast Iron, 60,000 BTU/Hr., Multi-fuel Capability, heats up to 3000 Sq.Ft. FIREPLACE INSERT: Vintage Cast Iron, 35,000 BTU/Hr., Multi-fuel Capability, heats up to 1500 Sq.Ft. WOOD PELLET STOVE, Vermont Cast Iron Stove, Autoignite, 42,000 BTU/Hr., Heats up 1500 TO 2000 Sq.Ft. STOVE WOOD PELLET, Beautiful BAY WINDOW, 45,000 BTU/Hr., Wood Pellets, Heats up to 2000 Sq.Ft. JUMBO WOOD PELLET STOVE, 300 LB Hopper, Auto-ignite, 50,000 BTU/Hr., Heats up 2000 TO 2500 Sq.Ft. STOVE CORN/PELLET, Beautiful BAY WINDOW, 50,000 BTU/Hr., Multi-fuel, Heats up to 2500 Sq.Ft. STOVE CORN/PELLET, High Tech, 52,500 BTU/Hr., Multi-fuel Capabilty, Heats up to 2500 Sq.Ft. STOVE CORN/PELLET, Colonial Cast Iron, 60,000 BTU/Hr., Mult-fuel Capblty, Heats up to 3000 Sq.Ft. STOVE CORN/PELLET, Vintage Cast Iron, 35,000 BTU/Hr., Mult-fuel Capblty, Heats up to 1500 Sq.Ft. MOBILE HOME STOVE, for Corn/Pellet/Mult-fuel, 52,500 BTU/Hr., Heats up to 1500 S.Ft. FRESH AIR KITS, install one or use inside warm air and BURN-UP 100 dollar Bills! SAVE $$$$. Buy a Stove, Furnace, Boiler, or Fireplace Insert from one of the leaders in the country...THAT'S US! There is a Warranty of as 3 YEARS on the heat exchanger, combustion chamber, the fire box, door, any structural steel, etc., 1 YEAR Warranty on Glass, and 1 YEAR Warranty on electronics. Be careful from whom you buy. We are a Dealer specializing in wood pellet and corn stoves and can help you through your installation as well as and trouble shooting if necessary down the road. Be careful as others do not have the capability to do that. Winning bidders will be immediately mailed our 26 page OWNER'S MANUAL so they may read it and prepare for the future delivery of their Corn furnace (stove). In the Owner's Manual is a step by step instruction. Also installation for Exhaust Flue Vent Kit (not provided) and startup are provided. Exhaust Flue Vent Kit can be purchased separately at your request and/or check our Ebay Store. The unit is assembled in a box/crated pallet. Customer may have it shipped by a commercial freight carrier 400 lbs to the nearest large-city Main Terminal serving the customer's geographic area. Customer will drive down there in a pickup truck and the Freight Company will load it into their truck with a fork-lift truck. Check for DAMAGE BEFORE you pickup merchandise and note it on the delivery ticket. Cost ranges from $195 to $295 with an average standard rate lies in between at $245, so accordingly we charge a flat rate of $245. For another $50.00 we will ship direct to a local business in your town or nearby city that has a loading dock or a fork-lift truck. Lumber Yards, Farm Equipment Dealers, and local Manufacturers are good candidates. Call for rate quote for shipping outside the U.S. like Canada. Auto-Ignitor self-ignite, Heat Output ranges from 40,000 to 50,000 BTU/HR subject to burning Wood pellets or Corn, Heating Capacity ranging from 1,500 to 2,000 Square Feet with Operational Efficiencies expanding that to 2,500 Square Feet, Fuel Hopper Capacity 40 lbs, 10 Tube heat Exchanger. EPA tested Particle Emissions were less than 1.829 grams per hour. Weight of stove 325 lbs, weight of shipping with crate/pallet 450 lbs, Dimensions: FRONT: Width 25", Front Height 21-1/4 inches, Front Depth 13"; REAR: Rear Width 21", Rear Height 19 1/2", Depth of Rear 9"; Total Depth 23", Thermostatic Control OPTION available , Gold, Black OPTIONS available , Corn Burning Conversion Kit Option available, Two Sizes of Surrounds: 39"x29", 45"x32". It has a Diagnostic System for Malfunctions. Electrical 110 VAC, 9 Amps, 60 Cycles, Safety Tested and Approved by Warnock-Hersey, Vancouver, B.C., Tested to: ASTM E 1509-95/ UL 1482-1996, ULC 3627-00/ ULC 3626-M93. as you can see it is both USA and Candian Approved, Manufacturer: American Pellet Recycling Industries, Ltd.